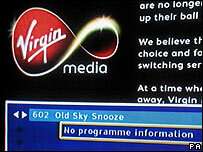 Virgin Media has launched a High Court action against BSkyB in a programming row between the UK broadcasters. The Sky Basic package, including Sky One which shows Lost and 24, was cut from Virgin last month in a row over fees Sky wanted to charge. Virgin said it was taking action to resolve the row, claiming Sky was abusing its dominant market position. Denying the claims, Sky said the action was "without foundation" and called on Virgin to resume negotiations. Virgin claims Sky tried to double its prices. However, Sky says the increase would have cost Virgin just 3 pence per customer per day. However, the charges for carrying Sky channels is not the only issue at stake. Virgin is also challenging the rates imposed by Sky for carrying Virgin's TV channels. Virgin Media includes the main cable TV supplier in the UK, which was formerly known as NTL. It has brought the action under the UK Competition Act 1998 and Article 82 of the EC Treaty. "Sky, which accounts for almost 70% of the country's pay TV subscribers, is dominant in the UK Pay TV market and has engaged in a strategy to stifle competition by using its dominance against Virgin Media," the company said in a statement. It accused Sky of "forcing" it to accept much lower fees for some of its channels, and then hiking the price it charged Virgin Media for providing the basic channels package. But Sky has denied the claims. "This action is without foundation and is an obstacle to bringing back Sky's basic channels for Virgin Media customers," chief operating officer Mike Darcey said. He added the company had invited Virgin to return to the negotiating table and that the services Sky was offering for the higher fee would have meant a "bigger and better choice" for customers. A Sky spokesman added that throughout negotiations between the two, Sky had offered to include two more channels - Sky Three and Sky Arts - as well as an On Demand and High Definition service to Virgin for the increased fee. "Virgin Media is saving money as a result of this dispute but it hasn't reduced prices," Mr Darcy added. "Millions of customers have lost access to the shows they enjoy and it is clear that many resent paying full prices for fewer channels." Last month the National Consumer Council accused Virgin Media and BSkyB of "behaving like children", and regulator Ofcom has asked for a review of the digital television market in the wake of the row. Virgin Media was formed from the merger of cable TV firm NTL and Virgin Mobile. The firm's biggest shareholder is entrepreneur Sir Richard Branson. BSkyB is run by media mogul Rupert Murdoch's son James.